Other strange things from the racing world included a stray dog on the track and a tractor causing a crash. The Baja 1000 is one of the most dangerous races in the world and for good reason. It’s a long rally along the Baja peninsula in the Mexican desert where it can be very hot, unforgiving and dangerous. It was the Baja 1000 where NASCAR champion Jimmie Johnson fell asleep at 3 am, had a serious crash at high speed where he was temporarily pinned inside and was stranded for 12 hours before someone could reach him. The Baja 1000 is so prestigious, it is raced by some of the best racers in other disciplines of racing as well as people in the entertainment industry. Actors James Garner, Steve McQueen and Paul Newman have been notable participants. This year, Indy 500 champion and IndyCar Series runner-up Alexander Rossi is competing in a Honda Ridgeline truck. 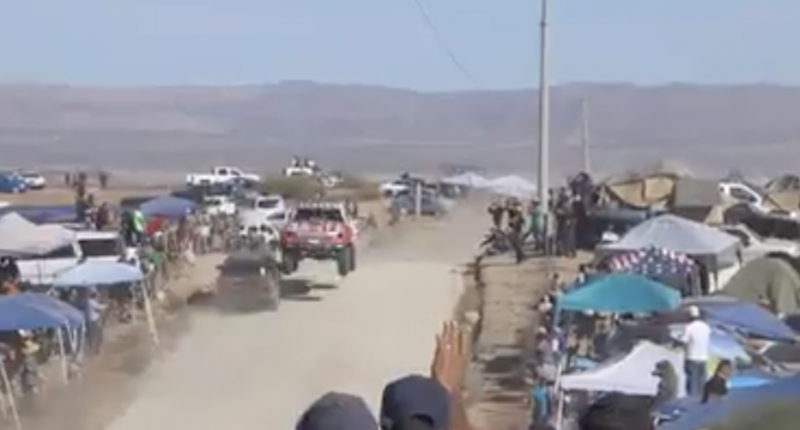 Just over 30 miles into the race, Rossi got his initiation to rallying when he came face to face with some fan driving a Jeep on the same road as the rally was going on. For some reason, roads aren’t closed to local traffic so the person in the passenger car was theoretically clear to be on the road but it seems reckless and unnecessarily dangerous to drive on a road where professional racers are racing toward you at about 100 mph. Rossi flew over the jump and only clipped the mirror on the Jeep. There wasn’t much Rossi could do about this, there’s no way to react in time and avoid a collision. Luckily, this was what happened because a few inches to the right would have not only resulted in a horrible crash but the realistic possibility of one or both cars slamming into fans on either side of the road. This isn’t the only strange thing to happen in a race this weekend. In Australia, a tractor was on a road which caused a crash in the Rally Australia along with police investigating two fans who put themselves way too close to the road when trying to get a sweet shot. Also, in the Macau Grand Prix, a stray dog got on the track in the middle of the Formula 3 qualifying race and miraculously wasn’t hit. That is a lot to absorb from this weekend in racing and it’s only Saturday.